Yes! Many moms and dads recognize that their high-functioning autistic (Asperger’s) youngster has a problem with anger-control. Many feel that their youngster needs to develop some anger-control skills, or needs to find some kind of counseling that will help him get along better in life (e.g., at school, with a parent, with siblings and classmates, etc.). In some cases, professionals have diagnosed a highly-aggressive youngster on the spectrum with Oppositional Defiant Disorder. Generally, anger falls into three main categories: 1) Fight, 2) Flight, or 3) Pretend to be “Flighting” (while finding indirect ways to Fight). Most high-functioning autistic kids with anger-control problems will go to either extreme of fight or flight. They tend to become aggressive and hostile, or they withdraw into themselves and become extremely quiet, silently stubborn, and depressed (i.e., a shutdown). The Fighters are pretty simple to recognize. They are aggressive. Many times, the characteristics of high-functioning autistic kids with severe anger-control problems are included in the professional diagnosis for Oppositional Defiant Disorder (ODD). Some of the warning signs in the following list are taken from the criteria for professional diagnosis. Others are additional common signs of anger-control problems for kids that are Fighters. The “Fighters” have anger-control problems when the problems are creating an unsafe situation for themselves, for others, or for property around them. If parents or siblings are the focus of physical aggression, the problem is extremely critical to address. High-functioning autistic teens who have abused others as kids are at a higher risk of becoming a threat to society than those who have not. Where these warning signs seem to be a part of daily life, intervention is strongly suggested. Intervention can be through anger-control counseling, or through a program dedicated and experienced in working with autistic kids with emotional regulation difficulties. The Flighters can also be fairly simple to recognize. They are passive. They do not fight back when confronted. Many of their traits may coincide with the diagnosis of depression. Some of the warning signs below are taken from the professional diagnosis for depression, and others are additional common signs of “shutdowns” for Flighters. The “Flighters” are in danger of destroying themselves emotionally from within. They are like a balloon being constantly blown into with no release valve. When they explode, their anger may be violent, and may lead to harming themselves, harming others, or destroying property. Internalized anger is potentially as destructive to a youngster as aggressive anger. High-functioning autistic kids who try to manage their anger through the Pretender style are as potentially dangerous to others and themselves as the other styles. Moms and dads tend to underestimate the Pretender style, because the danger does not seem to be as bad as the aggressive Fighter. From an anger-control perspective, an episode of anger can be viewed as consisting of three phases: escalation, explosion, and post-explosion. Together, they make up the hostility cycle. In this process, the escalation phase is characterized by cues that indicate anger is building. These cues can be physical, behavioral, emotional, or cognitive (thoughts). If the escalation phase is allowed to continue, the explosion phase will follow. The explosion phase is marked by uncontrollable anger displayed as verbal or physical aggressiveness. The final stage of the hostility cycle is the post-explosion phase, which is characterized by negative consequences resulting from the verbal or physical aggression displayed during the explosion phase. The intensity, frequency, and duration of anger in the hostility cycle varies among children. For example, one high-functioning autistic youngster’s anger may escalate rapidly after a provocative event and, within just a few minutes, reach the explosion phase. Another youngster’s anger may escalate slowly but steadily over several hours before reaching the explosion phase. Similarly, one child may experience more episodes of anger and progress through the hostility cycle more often than the other. Despite differences in how quickly the anger escalates and how frequently anger is expressed, the child will undergo all three phases of the hostility cycle. 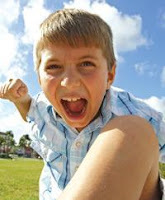 The intensity of the high-functioning autistic youngster’s anger also may differ. One child may engage in more violent behavior than the other in the explosion phase (e.g., he may assault someone). Another child may express his anger during the explosion phase by shouting at or threatening parents. Regardless of these individual differences, the explosion phase is synonymous with losing control and becoming verbally or physically aggressive. 1. When Cory becomes frustrated, use those incidents as "on-the-spot lessons" to help him learn to calm himself down (rather than always relying on you to calm him down). Every time he acts-out due to low-frustration tolerance, ALWAYS use that moment as a teaching moment. For example, explain to him that we all have little signs that warn us when we’re getting frustrated. We should listen to these signs, because they can help us stay out of trouble. Next, help Cory recognize what specific warning signs he may have that tells him he is starting to get angry (e.g., I talk louder, my cheeks get hot, I clench my fists, my heart starts pounding, my mouth gets dry, I breathe faster, etc.). 2. Use books and social stories about anger to help your son understand and manage it. Well-presented stories about anger and other emotions validate a youngster's feelings and give information about anger. It is important to preview all books about anger, because some stories teach irresponsible anger-control. 3. Use role-playing, puppets, or videos to teach social skills (e.g., how to treat each other, how to work out disagreements, etc.). 4. Use feeling words to help Cory understand the emotions of others (e.g., “Robbie is sitting alone and looks very sad; he may be lonely” …or “When Michael tripped, he looked embarrassed”). 5. Train your son to respond to your "signal" (e.g., a hand motion) to stay calm. Give that signal as soon as he starts "stewing" about something. Alternatively, you can use distraction as soon as you notice him exhibiting an anger sign. If he refuses to be distracted or engaged in dialoguing about his anger and starts yelling, stomping or breaking an object, impose appropriate consequences. But, have these consequences in place ahead of time to serve as a guideline. That means that you have discussed them beforehand and written them out for future reference. Armed with a list of consequences (which preferably consist of withdrawing privileges or charging your son a "penalty"), encourage him to choose such alternatives as doing something else, walking away, or talking about the anger rather than acting it out. 6. Try a "time-in" rather than a "time-out." As a parent, you are Cory's main guide in life. He relies on you to be there with him through his difficult emotional experiences, whatever that may be. Thus, no time-out and no isolation may be the best option on occasion. Instead, try a "time-in." Sit with Cory and incorporate other methods mentioned in this post (e.g., work on breathing with him, ask him questions about his feelings, etc.). The important thing is to be fully present with Cory to help him through his emotions. Remember, you are teaching him social skills to be in relationships with others, rather than acting out alone. When some autistic kids are isolated, they often ruminate and feel guilty for their behavior. This only serves to create low self-esteem, which often cycles back to creating behavioral problems. 7. The thought "It's not fair" is a big anger-arouser for many high-functioning autistic kids. If that is the case, ask your son, "Do you feel you are being treated unfairly?" When he answers the question, listen and don't rush to negate his feelings. 8. Teach Cory to take a time-out from the difficult situation and have some “alone-time” for a few minutes. During the time-out, he can rethink the situation, calm down, and determine what to do next. The length of the time-out is determined by the intensity of the emotion. An autistic youngster who is simply frustrated may just need to take a deep breath. The youngster who is infuriated probably needs to leave the room and settle down. After Cory has calmed down, it’s time to decide on a more appropriate response to the situation. There are at least 3 positive choices: talk about it, get help, or slow down. Simplifying the choices makes the decision process easier. Even autistic kids can learn to respond constructively to frustration when they know there are just a few choices. These choices are skills to be learned. Take time to teach Cory these skills, and practice them as responses to mad feelings. 9. Teach your son to talk about how he feels. Give him a language to express his feelings. If he is too angry to talk or doesn't have the words to express his feelings, ask about the feelings relevant to the specific situation. For example, "Do you feel rejected?" "Hurt?" "Let down?" …etc. When your son expresses the feeling behind his anger (e.g., embarrassment or rejection), suggest some other ways to look at the same event that might not be embarrassing or humiliating. 10. Some high-functioning autistic kids get upset when they know they made a mistake. Instead of admitting their mistake, they act out in anger to deflect the attention off of them. If you realize that this might be the case, it's helpful to say to your son, "Everyone makes mistakes. I am okay with it. Don't feel so bad about it." 11. Stop any and all physically aggressive behaviors! Say something like, "I can't let you hurt each other," or "I can't let you hurt me." Then remove Cory as gently as possible. 12. Sometimes an autistic child’s anger and frustration are caused by very real and inescapable problems in his life. Not all anger is misplaced. Occasionally it's a healthy, natural response to the difficulties that the “special needs” child faces. There is a common belief that every problem has a solution, and it adds to the parent’s frustration to find out that this isn't always the case. Thus, the best attitude to bring to such a circumstance is not to focus on finding the solution, but rather on how you handle the problem as painlessly as possible. 14. Simple relaxation tools can help Cory calm down. For example, he can (a) use imagery and visualize a relaxing experience from either his memory or his imagination; (b) slowly repeat a calm word or phrase (e.g., “relax” or “take it easy”) and repeat it to himself; (c) breathe deeply from his diaphragm (however, breathing from the chest won't relax him, so he should picture his breath coming up from the belly). 16. One thing that makes many moms and dads angry is to see their youngster challenging their authority and defying them. Sometimes it may appear so, but that may not be the intention of the high-functioning autistic youngster. For example, the child may be too unhappy to be told ‘no’ because he wants something so badly. Of course, you shouldn't give in to your son’s demands, but try to understand what might really be his intention. 17. Many children on the autism spectrum act-out because they simply don’t know how to express their anger any other way. Kicking, screaming, swearing, hitting or throwing things may be the only way they know how to express their emotions. To help Cory express his frustrations appropriately, create an “emotion words” poster together (e.g., "Let’s think of all the words we could use that tell others we’re really frustrated"). Then list his ideas (e.g., angry, mad, annoyed, furious, irritated, etc.). Write them on a chart, hang it up, and practice using them often. When Cory is upset, use the words so he can apply them to real life (e.g., "Looks like you’re really frustrated. Want to talk about it?" …or "You seem really annoyed. Do you need to walk it off?"). Then keep adding new feeling words to the list whenever new ones come up in those "teachable moments" throughout the day. 19. Involve Cory in making a small list of “house rules” (e.g., we work out differences peacefully, we use self-control, we listen to others, we are kind to each other, etc.). Write them down and post them on the refrigerator. Make the rules clear, and follow through with meaningful consequences that are appropriate for Cory’s age when the rules are ignored. 20. Model responsible anger-control yourself. High-functioning autistic kids have an impaired ability to understand emotion when their parents show a lot of anger. Parents who are most effective in helping their kids manage anger model responsible management by acknowledging, accepting, and taking responsibility for their own angry feelings, and by expressing anger in direct and non-aggressive ways. 21. Help Cory to understand that anger is a natural emotion that everyone has. Say something like, "It's normal to feel angry. Everyone feels angry from time to time, but it is not O.K. to hurt others." 22. Help your son develop self-regulatory skills. Parents of kids on the spectrum do a lot of “child-regulation work" (i.e., doing things ‘for’ their child rather than ‘with’ their child). This is because parents know that their child has a very limited ability to regulate emotions. As the high-functioning autistic child gets older, parents can gradually transfer control to their child so that he can develop self-regulatory skills. 23. Facilitate communication and problem solving with Cory by asking questions (e.g., How can I help you? What can you do to help yourself? What do you need? Is your behavior helping you solve your problem? …and so on). 24. Encourage Cory to accept responsibility for his anger and to gain control by asking himself the following questions: Did I do or say anything to create the problem? If so, how can I make things better? How can I keep this issue from happening again? 25. Create a “ways to relax” poster. There are dozens of ways to help autistic kids calm down when they first start to get bent out of shape. Unfortunately, most of these “special needs” children have never been given the opportunity to think of those other possibilities. Thus, they keep getting into trouble because the only behavior they know is inappropriate ways to express their frustration. So, talk with Cory about more acceptable "replacement behaviors.” Make a big poster listing them (e.g., draw pictures, hit a pillow, listen to music, run a lap, shoot baskets, sing a song, talk to someone, think of a peaceful place, walk away, etc.). Once he chooses a replacement behavior, encourage him to use the same strategy each time he starts to get upset. 26. Encourage your son to “label” his emotions. For example, a permanent record (book or chart) can be made of lists of labels for “anger” (furious, mad, hot, irritated, annoyed), and he can refer to it when discussing angry feelings. 27. Be sure to VALUE what Cory is experiencing. For example, if he is hurt and crying, never say, "Stop crying." Instead, validate his experience by saying something like, "I’m sure that hurts. That would make me cry too." This makes an ally out of you, rather than a target for free-floating anger. As an ally, Cory learns to trust you, realizing you are there for him no matter what. If he can trust you, he can learn to trust himself and the outer world. 28. Acknowledge strong emotions, helping Cory to save face (e.g., say, "It must be hard to get a low score after you tried so hard"). 29. All of us exhibit some "signs" just as we begin to get angry. So, it’s actually fairly easy to identify the “anger signs” in a youngster with high-Functioning Autism. For example, you may detect a certain look in the eye, a tone of voice, or a tightness in your child’s body. Thus, your first course of action is to help him observe these signs right at the onset of anger. Once he can identify the early signs of his anger, he can also learn to diffuse it by self-soothing techniques (e.g., walking away, taking full and vigorous breaths, etc.). 30. Lastly, help Cory understand that he can “choose” how to react when he feels angry or frustrated. Teach him self-control and positive ways to cope with negative impulses (e.g., write about feelings, tense body and then relax, tell someone how you feel, play music or sing, look at books or read, hug a pet or a stuffed animal, find a quiet place or sit alone, exercise, draw or play with clay, count slowly, calm self by breathing deeply, etc.). By using a few of the ideas listed above, you can help strengthen your relationship with your high-functioning autistic youngster and give him the tools he needs to cope effectively with frustration and anger.